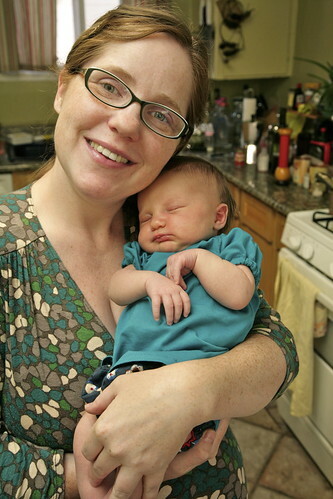 Inder Loves Folk Art: Dress and Bloomers: A moment in the life of a newborn. 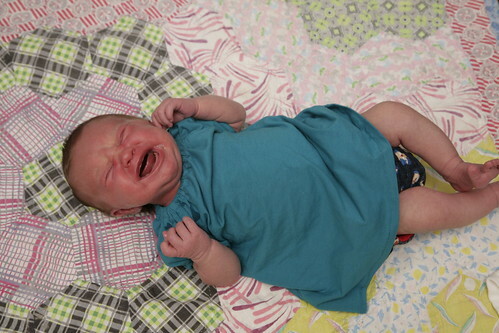 Dress and Bloomers: A moment in the life of a newborn. Inspired by Max California's gray knit version, I just whipped up the "Infant Peasant Dress" in a teal knit for baby Maggie, and paired it with some owl bloomers that I sewed for Joe when he was an infant (but never blogged). The bloomers were made from a pattern in Lotta Jansdotter's Simple Sewing For Baby. Both of these patterns are easy and fast, and both fit my teeny newborn with some room to grow. Yay! 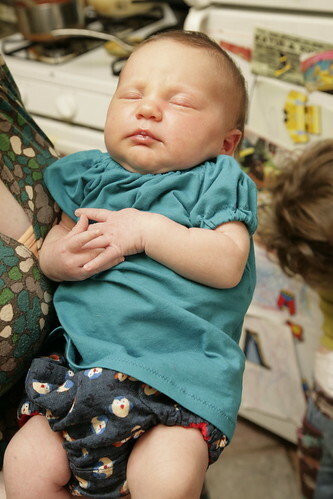 So then I tried to photograph Maggie in her mama-made outfit. First, let's try some tummy time! Uh .... you'd think I casually put her down on a stray leaf in the middle of the jungle where she is being sniffed by cougars, right? Whereupon she snuggled into my arm and promptly fell asleep. That's my girl: Goes from 80 to zero in ten seconds flat. Love the cranky shot - and the outfit! That's a really nice photo of you two together! The clothes are adorable and comfy looking. Is there a newborn out there who likes tummy time? I'm not sure I've ever met one! She is so cute!! And the knit dress is just adorable, yay for dresses :) I agree the last photo is a really great one. Take some time to like tummy time. She is lovely and you look so well. Cuteness! Love the 'sniffed by cougars' photo too :) She looks so content with you. Gorgeous outfit! She is so cute!! Always need a good crying shot or two! ;) Bumping knit peasant dress up my way, way too long list, check! ah! adorable! Their little screaming faces are intense aren't they?! Looks like you are having fun! ps - the outfit is perfect! i adore it! Hahhah! Eddie wore hers for the first time the other day! I laugh when she cries. I think it's different as a second child because with Vincent I would STRESS out. But now I just laugh and take photos of her because she sounds like a little demented sheep. Ah the power of momma. Revel in it!